Meet Desirée, a one woman wrecking ball of love and lust who leaves a trail of broken hearts wherever she goes. Things are awkward enough as she starts an affair with old boyfriend Fredrik Egerman right under the nose of her current lover Count Carl-Magnus Malcolm, but when their wives Anne and Charlotte find out, things start to get REAL. What's a girl to do? In Desirée's world the only thing to do is invite the whole gang for a weekend away with her family, throw in songs, banter, the mother of all parties and hope for the best. With everyone in one place, romance and the promise of second chances in the air, things are bound to work out right? A witty story of love, lust and regret, Stephen Sondheim's elegant wordplay and musical mastery won four Tony Awards, and features the classic 'Send in the Clowns'. 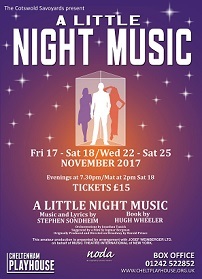 'A Little Night Music' will fire your passion and leave you breathless.